Anatomic locations of joints of thumb. 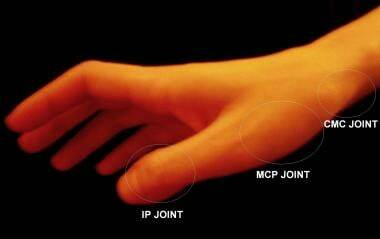 The MCP joint of the thumb is a condyloid joint that has a structurally stronger capsular ligament apparatus than the other four MCP joints of the hand do. Most thumb MCP dislocations are dorsal. They are caused by a longitudinal and dorsal stress along the axis of the digit that hyperextends the thumb and tears the volar plate of the joint. An example of this mechanism is a fall onto an outstretched hand (FOOSH) with an impact to the tip of an extended thumb. Volar dislocation of the MCP joint of the thumb is comparatively rare and is associated with tears of both dorsal capsule ligaments and the extensor pollicis brevis (EPB). For this reason, anterior dislocations are often treated with surgical repair of the torn structures, and closed reduction is rarely achieved with adequate postreduction stability. Plain film radiography is the definitive diagnostic modality for joint dislocations of the thumb, serving both to describe the geography of the dislocation and to rule out the possibility of coexisting fractures. Intra-articular fractures should be excluded by means of radiology before an attempt is made to reduce a joint in the thumb. These fractures include the Bennett fracture or oblique fracture through the base of the first metacarpal with dislocation of the radial portion of the articular surface. The Rolando fracture is similar to the Bennett fracture, except that the fracture at the base of the metacarpal is comminuted with similar dislocation of the fragments. Dislocation of the IP joint occurs to a much lesser extent than dislocation of the MCP joint does. These injuries are most commonly dorsal and are often associated with disruption of the overlying skin and soft tissues. Kadow TR, Fowler JR. Thumb Injuries in Athletes. Hand Clin. 2017 Feb. 33 (1):161-173. [Medline]. Bosmans B, Verhofstad MH, Gosens T. Traumatic thumb carpometacarpal joint dislocations. J Hand Surg Am. 2008 Mar. 33 (3):438-41. [Medline]. Maheshwari R, Sharma H, Duncan RD. Metacarpophalangeal joint dislocation of the thumb in children. J Bone Joint Surg Br. 2007 Feb. 89 (2):227-9. [Medline]. Yüksel S, Adanır O, Beytemur O, Gülec MA. Volar dislocation of the metacarpophalangeal joint of the thumb: A case report. Acta Orthop Traumatol Turc. 2017 Jul. 51 (4):352-354. [Medline]. [Full Text]. Dillon JP, Laing AJ, Thakral R, Buckley JM, Mahalingam K. Volar dislocation of the index carpometacarpal joint in association with a Bennett's fracture of the thumb: a rare injury pattern. Emerg Med J. 2006 Mar. 23 (3):e23. [Medline]. Drosos GI, Kayias EH, Tsioros K. "Floating thumb metacarpal" or complete dislocation of the thumb metacarpal: a case report and review of the literature. Injury. 2004 May. 35 (5):545-8. [Medline]. Khan AM, Ryan MG, Teplitz GA. Bilateral carpometacarpal dislocations of the thumb. Am J Orthop (Belle Mead NJ). 2003 Jan. 32 (1):38-41. [Medline]. Vashista GN, Krishnan KM, Deshmukh SC. Simultaneous dislocations of the carpometacarpal and metacarpophalangeal joints of the thumb. Injury Extra. 2004 Jul-Aug. 35 (7-8):56-8. [Full Text]. Lahiji F, Zandi R, Maleki A. First Carpometacarpal Joint Dislocation and Review of Literatures. Arch Bone Jt Surg. 2015 Oct. 3 (4):300-3. [Medline]. [Full Text]. Pushpasekaran N, Shekhawat V, Palanisamy S, Ravi B, Gupta D. Simultaneous Bennett's Fracture/Dislocation and Dorsal Fracture/Dislocation of Inter Phalangeal Joint of Thumb- A Case Report. J Clin Diagn Res. 2016 Sep. 10 (9):RD01-RD02. [Medline]. [Full Text]. Shih KS, Tsai WF, Wu CJ, Mudgal C. Simultaneous dislocation of the carpometacarpal and metacarpophalangeal joints of the thumb in a motorcyclist. J Formos Med Assoc. 2006 Aug. 105 (8):670-3. [Medline]. Catalan-Amigo S, Pedemonte-Jansana J, Navarro-Quilis A. Simultaneous dislocation of both joints of the thumb with a fracture involving the interphalangeal joint. A case report and a review of the literature. Acta Chir Belg. 2007 Nov-Dec. 107(6):728-30. [Medline]. [Guideline] Torabi M, Lenchik L, Beaman FD, Wessell DE, Bussell JK, Cassidy RC, et al. ACR Appropriateness Criteria®: acute hand and wrist trauma. American College of Radiology. Available at https://acsearch.acr.org/docs/69418/Narrative/. 2018; Accessed: April 4, 2019. Verhelle N, Van Ransbeeck H, De Smet L. Irreducible dislocation of the interphalangeal joint of the thumb: a case report. Eur J Emerg Med. 2003 Dec. 10 (4):347-8. [Medline]. Hirata H, Takegami K, Nagakura T, Tsujii M, Uchida A. Irreducible volar subluxation of the metacarpophalangeal joint of the thumb. J Hand Surg Am. 2004 Sep. 29 (5):921-4. [Medline]. Hong E. Hand injuries in sports medicine. Prim Care. 2005 Mar. 32 (1):91-103. [Medline]. Shah SR, Bindra R, Griffin JW. Irreducible dislocation of the thumb interphalangeal joint with digital nerve interposition: case report. J Hand Surg Am. 2010 Mar. 35 (3):422-4. [Medline]. Position of hyperextension used for reduction of dorsal interphalangeal (IP) joint dislocation. Position of hyperextension used for reduction of dorsal metacarpophalangeal (MCP) joint dislocation. Hand position used for testing if laxity is present with valgus strain of metacarpophalangeal (MCP) joint. Such laxity suggests presence of ulnar collateral ligament (UCL) tear and indicates possible existence of Stener lesion. The authors and editors of Medscape Drugs & Diseases gratefully acknowledge the contributions of previous author James Emanuel Rodriguez, MD, to the writing and development of this article, as well as the assistance of Lars J Grimm, MD, MHS, with the literature review and referencing for the article.